1 of 3 Heat vegetable oil in large pot. Add onion and carrots; cook 7 minutes, stirring occasionally. Add sweet peppers and cauliflower; cook 8 minutes, stirring occasionally. Add garlic, tomatoes, tomato paste, vegetable broth, creole seasoning and salt. Bring to boiling. Reduce heat to medium-low; cover and simmer until vegetables are almost fork-tender, about 18 minutes. 2 of 3 Add squash; cook until squash is cooked through but still retains its shape, about 5 minutes. 3 of 3 Cook chorizo in skillet over high heat until browned, 5 minutes. Remove to paper toweling. 1 of 2 Heat olive oil in large skillet over high heat. Season shrimp with the salt and pepper. Add shrimp to skillet; saute until cooked through, pink and curled, 2 to 3 minutes each side. 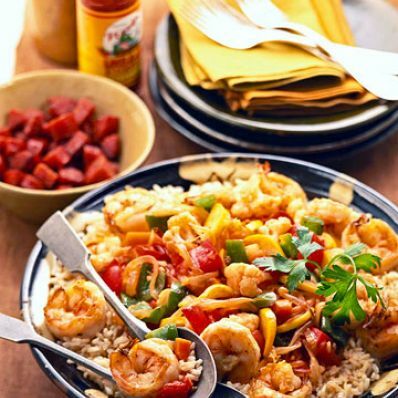 Remove shrimp from skillet; keep shrimp warm. 2 of 2 To serve, spoon cooked rice into large bowl. Spoon vegetable jambalaya over rice. Arrange cooked shrimp around edge. Serve browned chorizo in a bowl on the side as an optional garnish. Per Serving: 62 g carb., 22 g Fat, total, 531 kcal cal., 25 g pro., 1681 mg sodium, 9 g fiber, 5 g sat. fat, 109 mg chol.